The Social Channel of Value explains our era’s drivers of economic transformation and how leaders can use them to strengthen their careers, organizations and communities. Profound shifts in human beings’ means of production restructure society and business because they alter the amount of “value” human work can create as well as the type of “products” that encapsulate people’s work. Individuals and organizations that notice, observe and understand these shifts early on can improve their relevance and competitiveness. Many of those that do not respond quickly enough go down with the ship. Since the Social Channel is so important, I have published the Social Channel Trilogy, which is summarized here. Find even more information on the Social Channel home page. Social Channel One describes the drivers of change. It describes the shift away from mass-produced products and mass-managed services to products and services that are designed for individuals—using networked social business technologies and behaviors as the communication and management mechanism. Why the Industrial Economy’s mass-produced products may prove to be an exception to “human nature’s natural preference.” It claims the same development for mass-managed services. For most of human history, there were no products; everything was a service. How the Industrial Economy created wealth during an era of material scarcity that no longer exists. Global production of mass-produced products in many categories has outstripped consumption, which has led to commoditization. This trend is accelerating. The role of Industrial Economy marketing has been to “create demand” by communicating benefits of product features. In commoditized markets, product features lose the ability to differentiate, so marketing is losing effectiveness. Marketers have the opportunity to transform their roles by serving stakeholders in the Social Channel rather than pushing content to people as they have traditionally done. Statesmen, economists, business executives and community leaders around the world lament “the bad economy,” and this reflects their knowledge gap about the shift. The “economy” has simply changed from the Industrial Economy to the Knowledge Economy. Much better times are ahead for people and organizations that understand the Knowledge Economy’s Social Channel and its rules. How leaders can shift the front end of organizations by developing deep and broad skills with interacting with stakeholders in digital social venues. How to shift the back end of organizations with smart manufacturing, distribution and management that is driven by collaboration with stakeholders in the Social Channel. Get Social Channel One here. Social Channel Two is a deep dive into the Social Channel, which sits on top of the Productized Channel and the Core Channel. 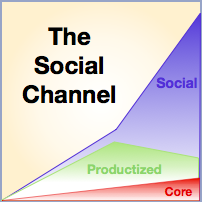 The Social Channel of Value describes the Knowledge Economy’s means of production. Digital social technologies digitize two human traits—thinking and relating—so social business represents a quantum leap in people’s means of production. In the Industrial Economy, the assembly line represented an analogous leap in production, which led to unprecedented wealth. The Knowledge Economy will produce even more wealth after people learn its tools of production. The Core Channel of Value describes the basic definition of recognized work. Examples are jacket and vehicle. Makes the point that the Core Channel preceded products. Most things were made to order, so they were services. The Productized Channel of Value sits on top of the Core Channel. It first used mass production to mass-fabricate things, which created inventory for the first time. Argues that “productizing” human work created wealth by lowering the cost of work and enabling more people to buy work products (jacket, vehicle). “Brands” are endangered because commodities will no longer support the concept of brands as they are managed today. The Social Channel applies to most products and services what has already happened in music, news media, art, video and films. In the Social Channel, users are involved with many phases of creating and distributing products and services. This trend is in its infancy. How social business + mass customization will enable products and services to be mass-produced and individualized. Action steps and timelines for front end and back end transformation of the organization. Get Social Channel Two here. Social Channel Three shows how to use the Social Channel to compete in the context of global markets. It shows how to defend “home” markets against “foreign” competitors by using cultural advantages in the Social Channel. Similarly, it shows how to use the Social Channel to penetrate “foreign” markets. Of course, any competitor in any market can use the Social Channel to increase relevance to stakeholders. Quick overview of the global economy as it relates to social business and the Social Channel. The Social Channel is “social,” so cultural knowledge gives the advantage to “home brands” when they act to create relationships online. Brands that try to differentiate on product features make it easier for “foreign” competitors. Describes key processes to develop the capability to create, build and scale meaningful relationships in the Social Channel. Cultural knowledge is a huge advantage in developing relationships and intimacy. Firms maximize relevance when they ground their Social Channel interactions in helping users achieve unusual outcomes. That’s a cornerstone of the Social Channel. The role of use cases. How to use the Social Channel’s competitive principles to defend home markets. How to use the Social Channel’s competitive principles to develop foreign markets. Get Social Channel Three here.